How do you like your eggs in the morning? 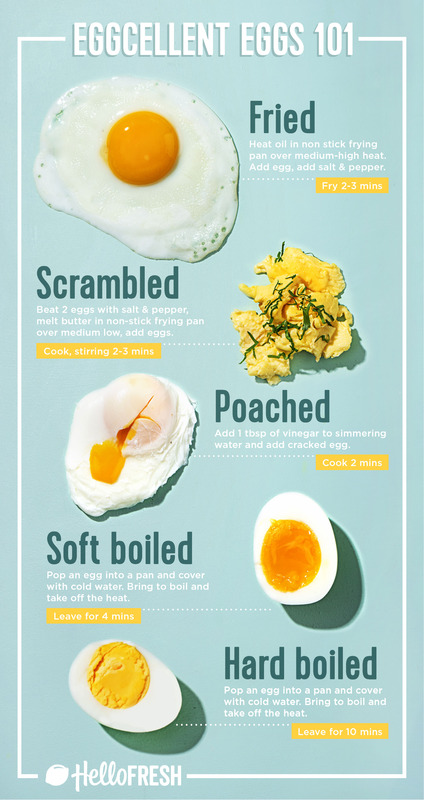 Here’s how to make the perfect poached, fried, boiled and scrambled eggs. Eggs, in all their sunshine yellow glory, are the humble hero when it comes to a quick-fix breakfast, lunch or dinner. From a runny boiled egg perfect with toast soldiers (our Sunday night go-to), to a speedy scrambled eggs breakfast, there is literally an egg recipe for every time of day. Beat 2 eggs with a fork and season with salt and pepper. Melt butter in non-stick frying pan over medium low, add eggs. Cook, stirring for 2 minutes. Serve with thickly cut buttery toast. Heat oil in non-stick frying pan over medium-high heat and crack the egg directly into the hot pan. Add salt and pepper and fry for 2-3 minutes. TIP: for a crispy fried egg, tilt the pan towards you and carefully spoon the hot oil over the edges of the egg. Rather than cracking your egg straight into the pot, crack it into a small bowl. Then gently pour it into the water. Enjoy on toast, muffins or bagels with avocado, smoked salmon, cream cheese or spinach and ham! SO many options! Pop an egg into a pan and cover with cold water. Bring to boil, take off the heat and leave for 4 mins. Bring to boil, take off the heat and leave for 10 mins.